Ah, the old yearly renovations list. What joy. I feel like all we’ve done the last two years is home renovations! In 2014 we finished the renovations on our New York State home, which was great! Since the day the last nail went in to the renos, Hubby has been reading the local MLS religiously looking for a house on Lake Ontario for us to move to. 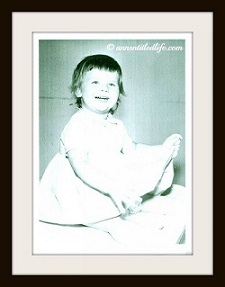 And I have since then become very wishy-washy about moving onto the Lake Ontario shoreline. Oh sure a view of the Toronto skyline would be awesome, and a sunset over the lake would be stunning, but we are not boaters or fishermen, and I am not certain that a house on the lake is worth the premium we’d have to pay. I’ve begun to think a water view might be doable, and Hubby has begun to think 50 acres near a gun range and his hunting land is even more doable (I do not agree with that – at all!) I also love this little town called Lewiston, and would be thrilled if we could find something there with a vista-view or on the Niagara River. In Florida, we have already begun looking for a bigger place. The floor plan makes the 1300+ sq ft here (plus balcony overlooking the ocean) seem tight. Hubby says he feels claustrophobic (this is a man who had a Manhattan apartment for 10 years!). I lived in a 1500 sq ft house for 10 years, and I have to say that the layout here is what is is enclosing, not the square footage itself. In any event, I am happy to look for another spot. I doubt we will buy on the ocean again (the deal here was tremendous, and it just isn’t to be had currently at this end of the St Augustine area), but possibly on the intracoastal or overlooking a preserve for a future condo, townhouse or second home. 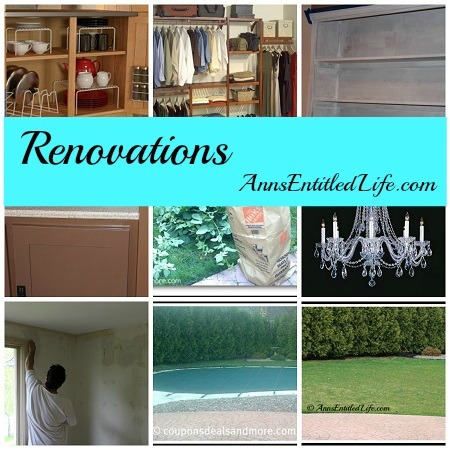 Even with our intentions of possibly moving from two places, we still have a renovation list. When we walked into the Florida condo a few weeks, I was pleasantly surprised at how good it looked. To be honest, I had forgotten how much work we had done last year, even with a completion list! More like I had forgotten how well everything turned out! So much worked – from the paint color (white) to the blinds to the furnishings. It just worked. We still have things that must be done regardless of if we sell, actually, because we might sell! If we stay, we can live with what it will look like when finished with these last renovations, and if we move, the few things remaining are the next owners to deal with. 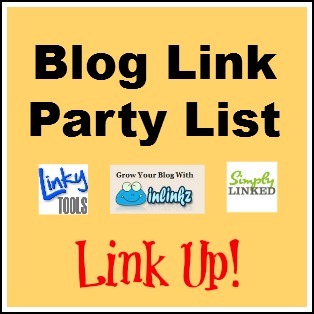 I will share posts on how all this goes down as each project is completed. Ann’s Entitled Life is first and foremost a diary for me (in my old age I’d forget my head if it wasn’t attached, these posts really help jog the old memory-banks), so I do want to keep track of what improvements we make to what residence. 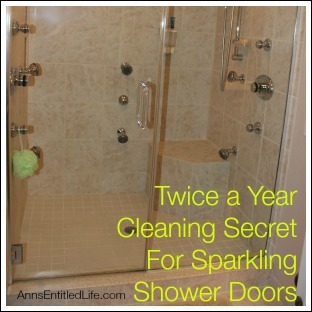 Are you don’t any renovation projects this year? Have you started? How is it coming along? 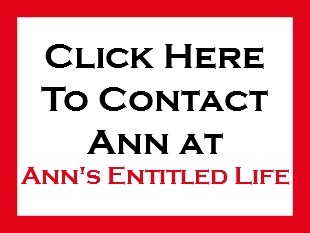 For more Renovations posts on Ann’s Entitled Life, click here. We have finally come to the end of our New York State home renovations! YAY!! That only took two years. Never let it be said we rush things in the Ann’s Entitled Life household. Hubby did nothing with his office built-ins, and I am not expecting him to. Our final project on the list, was carpeting in Sonny-boys old room. We also decided that, since we are a shoes on household, getting rid of the white Berber that was in the upstairs hallways made a lot of sense. The hallway flows into Sonny-boy’s old room. We also decided to recarpet the cedar closet (also off the hallway), and the hallway linen closet. 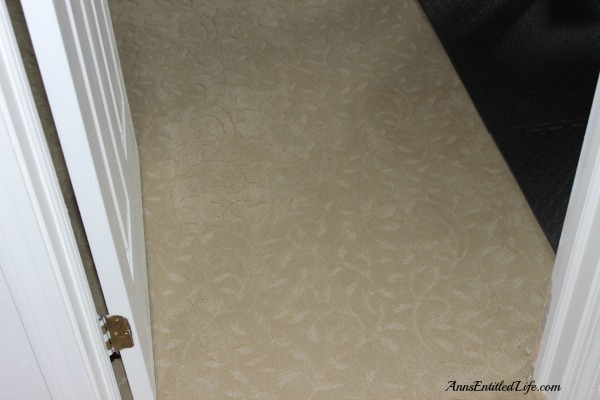 The downstairs coat closet also had carpeting, so for the sake of constancy, we had that replaced too. We had a real case of paralysis in choosing this carpet. Hubby and I actually went over to the carpet store last year, picked out a few styles and colors, got the swatches in the mail, and then couldn’t make up our minds. We knew we’d have to wait for the banister to be completed, so we figured when we got back from Florida, it would be decision time. 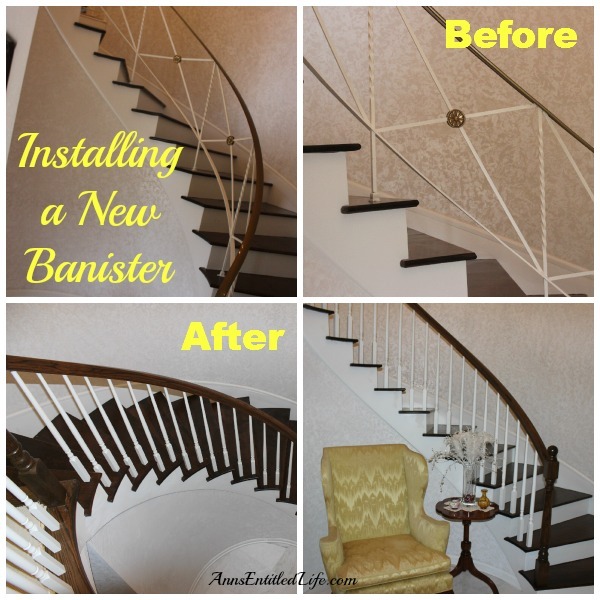 Our decision earned a reprieve as the completion of the staircase banister was delayed for several months. 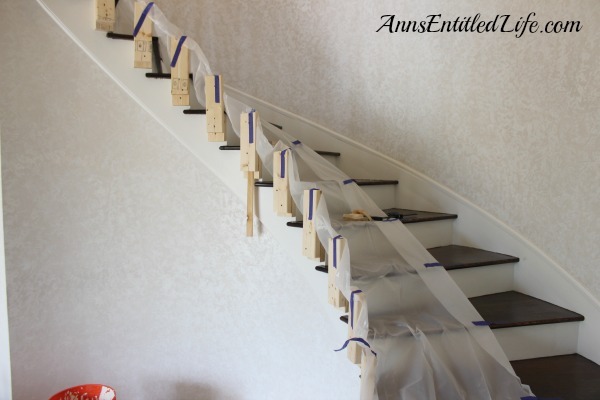 But, once that banister was completed, we knew it was time to choose. And, at that point, Hubby abdicated the decision making process completely. So now I was stuck. It was me, me, all me; I was to get the credit for a carpet well chosen, or the blame for a monstrosity that did not fit with our home decor, or our lifestyle. I looked at the carpet store website again and discovered they had an in-home consultation service. So, I emailed to schedule a consultation figuring they’d have more styles and/or opinion on what would work for us, and waited for a call to set up an appointment. Finally a month later, after Max’s illness was diagnosed and we were back on an even keel, I gave the carpet place a call to see when they could schedule a house call. Apologizing profusely for the delay (I think the web-fairies pixelated my email), I had an appointment the following week. I ended up choosing one of our original four choices after the stainmaster process was explained (they don’t spray it on top, they process the nylon with it and then make the carpet), and the consultant let me know he loved choices A and B and had seen them installed many times. While I didn’t really want to be part of a carpet-pack, I did like the swatches I had originally chosen last years, and I went for choice A! After all that delay, the carpet was installed a mere three weeks later. We got the call just 10 days after placing our order to set up an installation date. Since Hubby was removing the old carpet so he could screw down the loose floorboards at the joists to try and take care of the squeaks in the floor, I knew he needed a little bit of lead time. I gave him 10 days. I emptied out the closets upstairs immediately after scheduling the appointment. I also emptied out Sonny-boy’s room, although Hubby didn’t need to do anything there: he had removed the carpet and screwed down those floorboards last year. The downstairs coat closet I needed some help with emptying, but did most of that alone. I left the two heavy pieces for Hubby. Well, like any really good procrastinator, Hubby works well under pressure, and he had the carpet removed, the squeaks fixed, and the carpet shim installed (from the top of the stair down as a transition in height), approximately 12 hours before the carpeting was due to be installed. When the carpet installation guys called to say they would be over at 1pm, I am sure I heard Hubby lament that he could have put off doing that work until Friday morning. I swear that man wants to see how much he can push me before my head spins around and I spew green pea soup! The carpet guys had the 4 closets (one in Sonny boy’s room too), the hall, and Sonny-boy’s room carpeted in approximately 4 hours. I have written before about what a giant packrat Hubby is… if he thinks there might be a use for something in the future, he’s reluctant to part with an object regardless of how ridiculous said object is. Our sewer problem helped clean a LOT of his crap out of the basement, and, after I got huffy, led to the garage being shoveled out too! But, it turns out other parts of our home were also packed, and I couldn’t blame it all on Hubby (no matter how hard I tried). Now it was time for us to put away all the crap I had hauled out of those closets. The upstairs hall linen closet wasn’t bad at all. I had purged a while back, so I removed and replaced nothing. The cedar closet was just disorganized. I returned everything, yet for some reason it now seems empty! Sonny-boy’s old closet has Hubby’s hunting clothing. All in one spot. He had to haul up several loads from the downstairs coat closet, but now everything is all in one place, including waders and boots. I then spread out the furniture that had been crammed into my office and the spare bedroom into the appropriate rooms where each piece belonged. We also took the elliptical from our bedroom (that had become more Hubby’s clothes hanger than my exercise machine), and Hubby’s recumbent bike from my office (that I don’t think he has ever used! Sonny-boy used it the most. Would it shock you to learn the LED battery is dead!?) and relocated both pieces to Sonny-boy’s old room. One bag of clothing to GoodWill from the spare room pile later (that place really had become a dumping ground this past year! ), and the upstairs if wonderfully clean, neat, and more importantly: finished!! The cost closet downstairs!? That was another story. It never ceases to amaze me how much junk we can collect. And stuff into a small space. 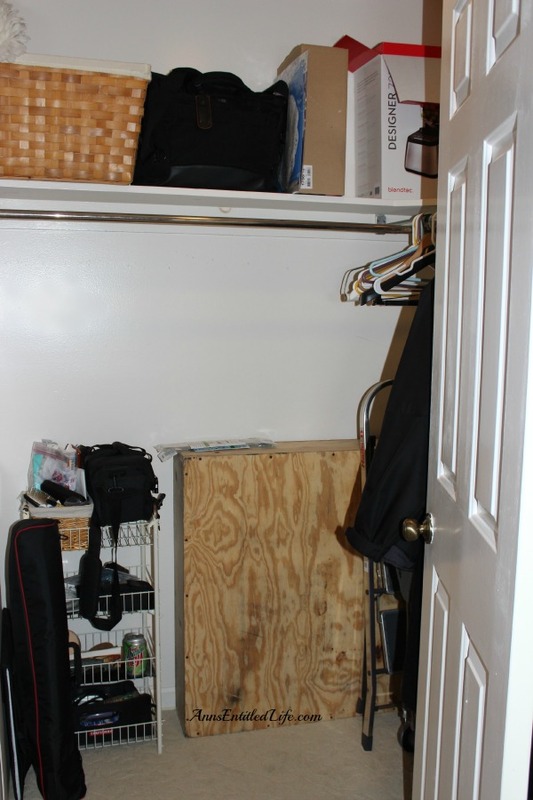 That coat closet is only 5′ x 5′, but my goodness did it have “stuff” in it! All my camera equipment, an old broken wine cooler, six boxes packed for the condo, the dining room table leaves; you name it and it was probably stuffed somewhere in that closet! I emptied everything out into the dining room only to discover how many of the things in that closet were Hubby’s. Oh sure, he was thrilled to find a set of reference books I had ordered in 2008 but never took out of the packaging, but for the most part, the stuff that didn’t belong in that closet, belonged to Hubby, Florida, or the donation pile. Hubby and I spent longer going through the stuff tucked away in that coat closet than setting the entire upstairs to rights! To say we have too much stuff, is an understatement. After all the renovations of the past two years, I do think we’ve gotten a better handle on what we have, what we don’t (and never will) need, purging, sorting and donating. I think both of us could spend some time going through our clothes (Hubby more than me – I have one small closet and two dressers full, he has 4 closets full of clothing!) and donating what we no longer wear. Both of us could also spend some time shoveling out our offices, both of which look like paper-bombs went off inside them! As we conclude two years of renovations in our New York State home, I only wish I could say this was the end of our renovation projects. Up next: Florida bathrooms and kitchen cupboards! I swear we aren’t happy lately unless we are living in a mess. 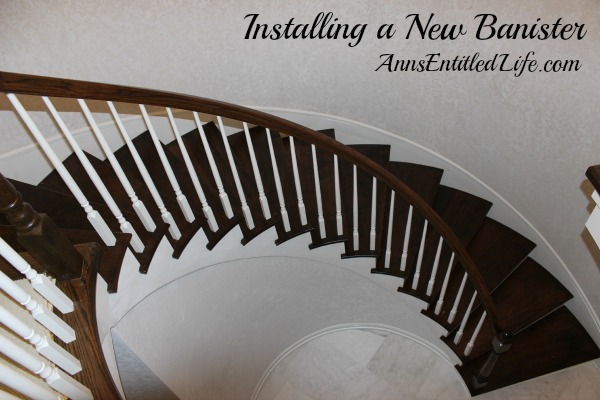 Installing a New Banister – Updating an existing, ugly, old fashioned staircase banister into an eye-catching wood statement banister. Believe it or not, we are still doing renovations on our house in New York State. It feels like all we’ve been doing the past two years – in New York and in Florida – is renovations! But, things are definitely drawing to a close. The new banister that was supposed to be finished while we were away this past winter suffered a number of set-backs, and was not completed until the end of June. Even though we did not install it, it still gave the professionals fits. 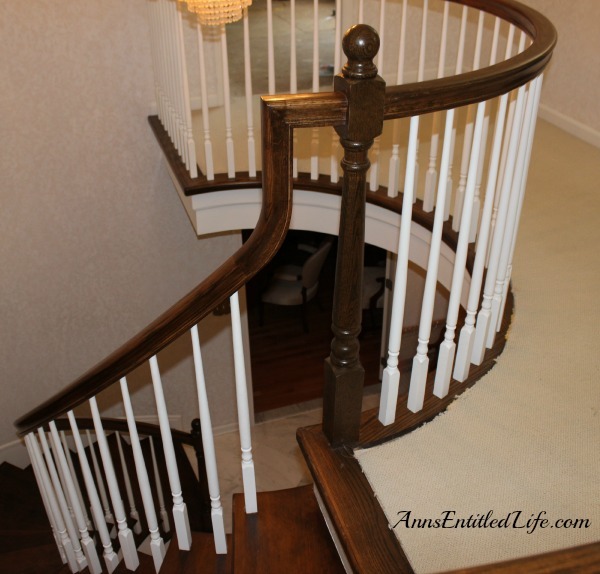 We have a circular staircase, and a circular staircase handrail isn’t as easy to replace as one with straight lines. We needed the treads redone too, and Joe got in a few weeks after we left for Florida and had those finished asap. 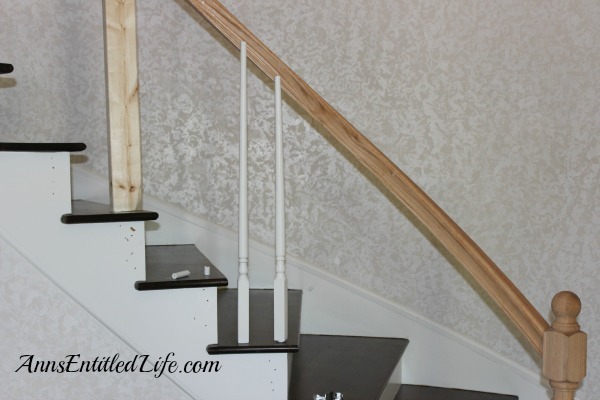 Keenan (who also did out hardwood floor install) was to have taken his blueprint of the in-place banister before Joe removed it to refinish the stairs, and didn’t. That caused Keenan a lot of issues when trying to replace the banister. 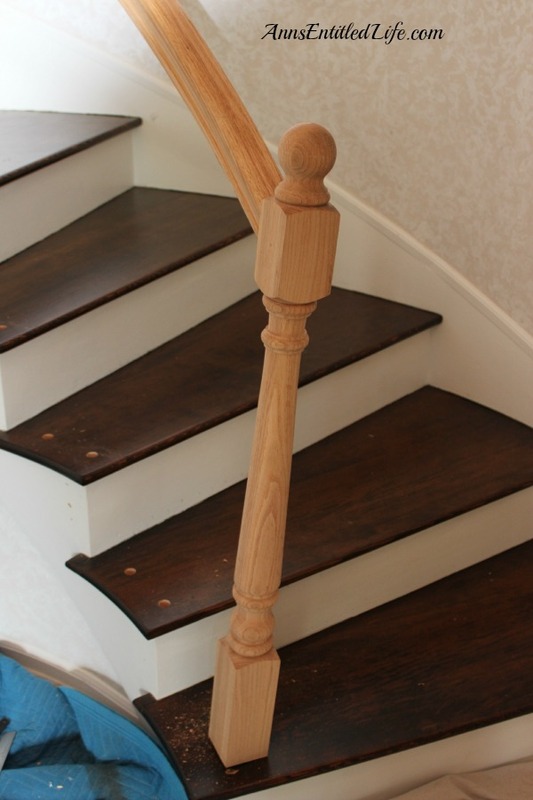 He actually went through two pieces of banister wood before the third one was fitted, and installed, correctly. He had another master carpenter helping him for the second and third try. These guys were making my head hurt with all the geometry. The transition from the top rail down to the handrail took some jiggering. 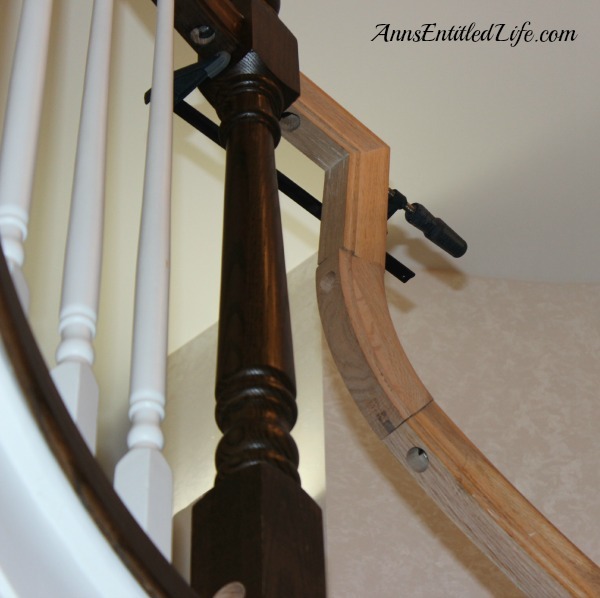 Before anything could be glued in, they had to set in the newel post, and then work from there. 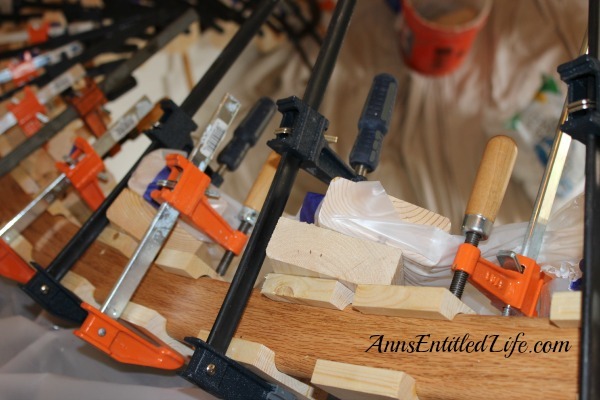 A series of straight wood pieces were drilled into the stair side. They were checked for plumb, and then held in place. The handrail was very interesting. This is the different layers that made it up. The days of one piece handrails are looooong gone. 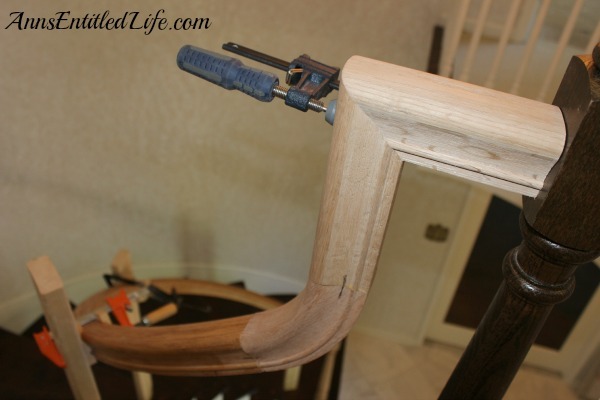 The handrail was fitted by bent lamination. 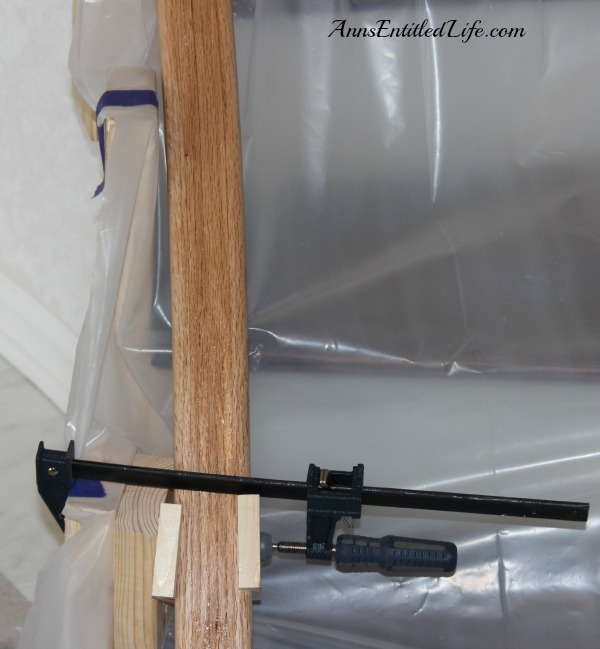 The glue helps mold the wood. 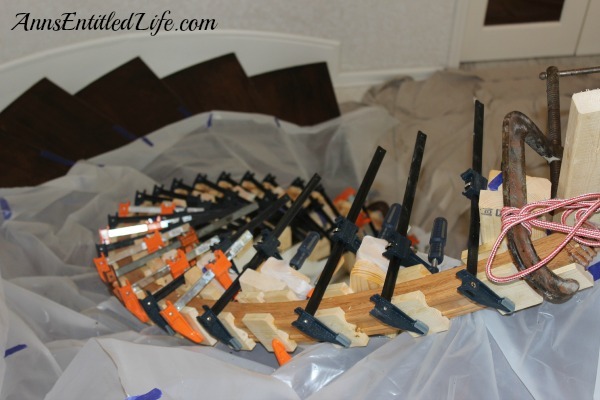 The glue dries over the course of a week, and you pick it up and it is now a perfect pattern to put on top of the spindles. We didn’t have a handrail for quite some time on this project – close to two months. It was removed, and then two rails – which didn’t work – were tried. The third time was a charm though! 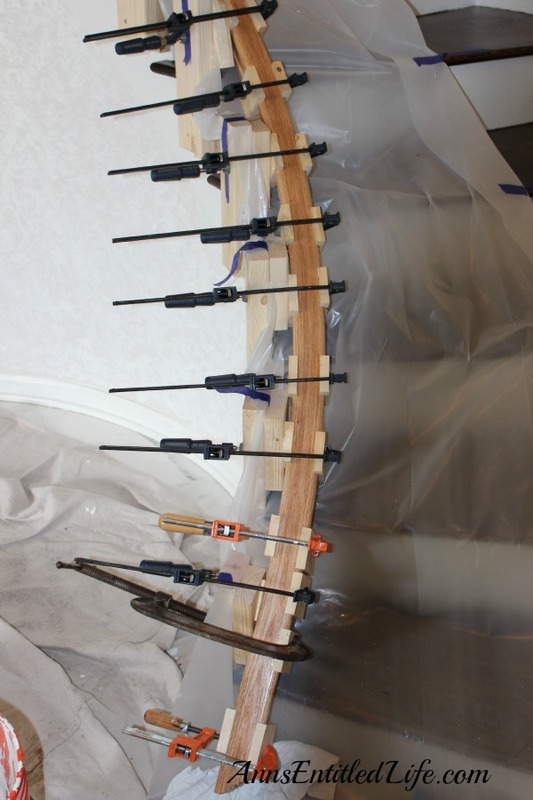 We had this bent lamination set-up in place for a good 10 days. I have to tell you, this set up freaked me out more than no handrail! 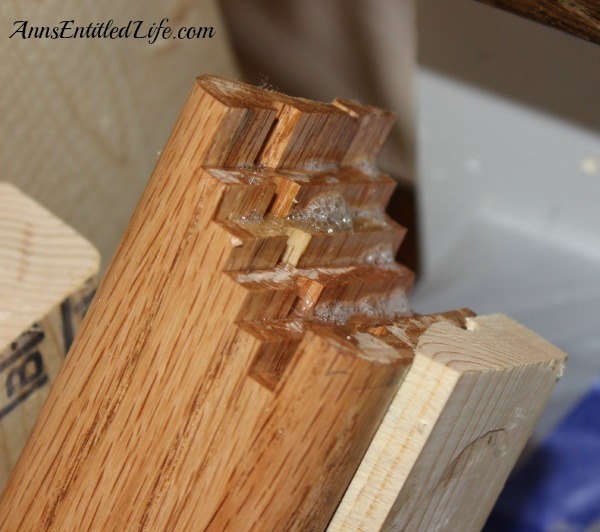 the spindles were a lot of pounding… with their hands! 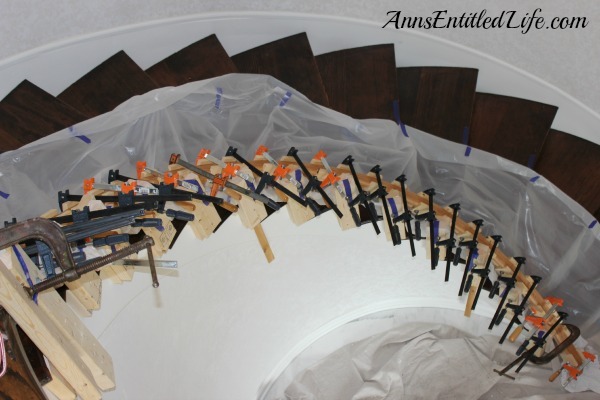 They had to finesse the spindles into each predrilled hole on the stairs. 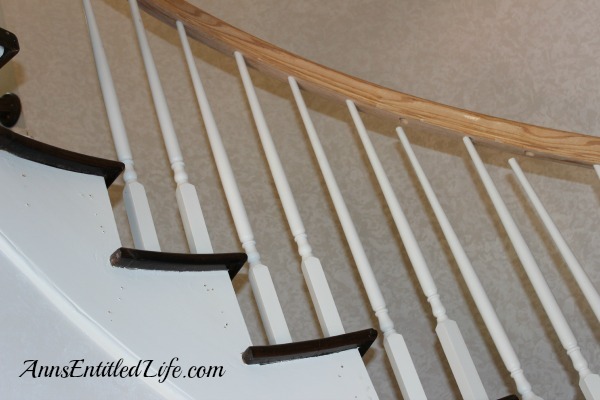 Then they had to smack the handrail down on the spindles so they wouldn’t move. A LOT of glue went into making this tight. In the end, I must say the banister looks phenomenal, and the upgrade of our funky-70s-style-original-to-the-house to what we currently has, is astounding. Note: the round apron came in as one piece and we were not here for that. It is truly a marvel! 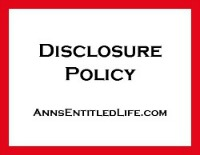 For more Library posts on Ann’s Entitled Life, click here. 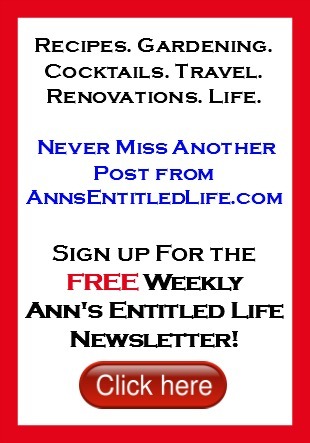 For Renovation posts on Ann’s Entitled Life, click here.